Frontispiece from the 1941 edition Yehoash’s translation of the Tanakh, published by the Yehoash Farlag Gezelshaft. 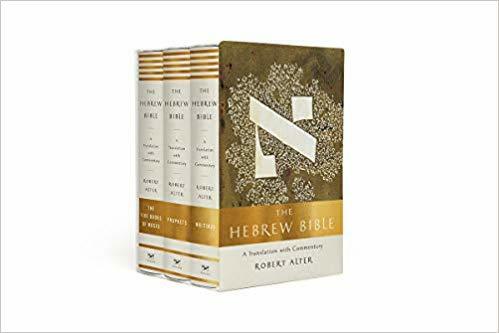 The recent publication of Robert Alter’s long-awaited translation of the entire Hebrew Bible into English has brought him many accolades, not only for the quality of the work but also for the effort itself, as a herculean achievement for a single person, realized over a period of more than twenty years. But Alter is not the first to tackle this monumental project; almost a century earlier, Solomon Bloomgarten—better known by his pen name, Yehoash—produced a landmark translation of the same text into Yiddish. Yehoash’s magnum opus, like Alter’s, was the result of years of solitary grappling with the task of rendering ancient Hebrew prose and poetry into a modern vernacular, an effort Yehoash first attempted in 1891 with a translation of a selection from the book of Psalms. 1 1 See Bertshi Vitkevits (Bernard Witt), Yehoash: A bibliografye fun zayne shriftn (Cleveland: Farlag A. Kahan, 1944), 3, no. 14. He began working steadily on rendering the entire Hebrew Bible into Yiddish during the first decade of the twentieth century, continuing until his death in 1927 at the age of fifty-seven. These two one-man translations have other points in common. At the same time, their differences offer telling insights into the dynamics of language use and language ideology, literary sensibilities, translation strategies, and understandings of the significance of their foundational source text for modern readerships. First, some noteworthy commonalities: Both translations appeared in print gradually, with the publication of individual books, before the complete Bible appeared in deluxe multi-volume editions (three books for Alter’s version in 2018, eight for Yehoash’s, most of which were issued posthumously, between 1926 and 1936). 2 2 Robert Alter, The Hebrew Bible: A Translation with Commentary (New York: W.W. Norton, 2018); Khumesh, neviem, ksuvim: yidish fun Yehoash, 8 vols. (New York: Farlag “Tanakh,” 1926-1936). Alter’s first translation in print was Genesis: Translation and Commentary, issued in 1996. 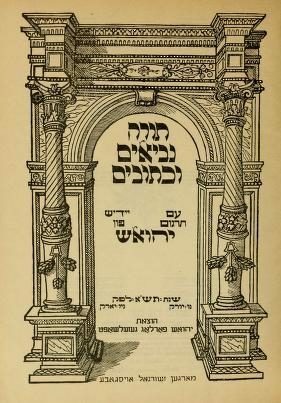 Yehoash’s initial publications were also of individual books: Yiddish renderings of Isaiah and a volume containing four books—Job, Song of Songs, Ruth, and Ecclesiastes—all issued in 1910. 3 3 Robert Alter, Genesis: Translation and Commentary (New York: W.W. Norton, 1996); Yishaye, trans. Yehoash (New York: Farlag “Yehoash,” 1910); Iyev, Shir hashirem, Rus, Koheyles, trans. Yehoash (New York: Farlag “Yehoash,” 1910). However, he was apparently dissatisfied with these translations and subsequently reworked them. Both men approached their daunting task as litterateurs: Yehoash as an author of poetry and prose, Alter as a scholar of modern literature, especially narrative, in English, French, German, modern Hebrew, and Russian. Translating Hebrew scripture was part of a shared cosmopolitan interest in belles lettres. Yehoash rendered other works of world literature into Yiddish, most famously his 1910 translation of Longfellow’s Hiawatha, reproducing the epic poem’s trochaic tetrameter (Af di preyri berg di royte, / Vu me brekht di lyulke-shteyner, / Gitshi Menito, der shtarker, / Er, der hersher funem lebn,…), and The Rubiyyat of Omar Khayam (from FitzGerald’s English rendering) in 1907. 4 4 Henry Wadsworth Longfellow, Dos lid fun Hayavatha, trans. Yehoash (New York: Farlag “Yehoash,” 1910); Yehoash’s translation of the Rubiyyat first appeared in Tsukunft, May 1907, 264-267. In addition, Yehoash published translations of works by Byron, Kahlil Gibran, Heine, and Edmond Rostand, among other authors, in Yiddish periodicals. Robert Alter’s translation of The Hebrew Bible. W. W. Norton & Company, 2018. But compared to Alter, Yehoash had less success securing publishers for his Yiddish rendering of the Bible. Unable to find a press for his translation (his first efforts were self-issued), the author arranged with the daily newspaper Der tog to print his some of his translation (the Pentateuch and selections from the Prophets) in installments during the years 1922-1925. 5 5 See Vitkevits (Witt), Yehoash: A bibliografye, 174-206. Only his final version of the Pentateuch appeared in book form before he died, again in a self-financed edition. Yehoash’s widow and daughter oversaw the publication of the entire translation in multiple formats, including a children’s edition in 1940 and a bilingual two-volume set that paired the Yiddish with the original Hebrew, as well as a separate volume of notes that Yehoash had compiled to explain textual variants and translation decisions, issued in 1949. 6 6 Yehoash Khumesh far kinder (New York: Yehoash farlag gezelshaft, 1940); Yehoash, Heores tsum tanakh (New York: Yehoash Farlag, 1949). On the publication history of Yehoash’s Bible translation, see Yaelle R. Frohlich, “The Publication and Dissemination of the Yehoash Bible, 1922–1942,” Shofar 35, no. 4, (summer 2017): 43-61. Whereas Alter, who received a PhD in comparative literature from Harvard University, worked on his translation while a professor at the University of California Berkeley, Yehoash was both a freelancer and an autodidact. To prepare himself for the task of translating Hebrew scripture, the author immersed himself in the study of ancient Semitic languages and traveled to Palestine in 1913, “there to absorb into his sensitive soul the atmosphere of the country which produced the Bible.” 7 7 Harry M. Orlinsky, “Yehoash’s Yiddish Translation of the Bible,” Journal of Biblical Literature 60, no. 2 (June 1941): 174. The most revealing distinctions between these two translations emerge from their authors’ respective motives for taking on this project, which are centered not on the shared source text as much as on each translator’s understanding of the relationship between the Hebrew Bible and the modern language into which they sought to render the text. Alter characterizes his translation as “an experiment in re-presenting the Bible… in a language that conveys with some precision the semantic nuances and the lively orchestration of literary effects of the Hebrew and at the same time has stylistic and rhythmic integrity as literary English.” 8 8 Alter, The Hebrew Bible, vol. 1, xiii. Moreover, Alter characterizes his approach as a corrective to the considerable accumulation of English-language Bible translations, from the venerable King James Version to those published in the modern era. He argues that these versions all fail to some degree to capture the distinctive character of ancient Hebrew narrative, such as its extensive use of parataxis and pointed repetition of words within a limited lexicon, in contrast to predilections in English for hypotaxis and richly varied synonymity. In addition, Alter addresses distortions of ancient Hebrew language and sensibility that Christian translators have imparted to the text. For example, he explained in an interview that “in trying to be faithful to the literary art of the Hebrew Bible I certainly edged it away from being merely a precursor to the New Testament,” citing the example of the word “soul,” which he eschews. “That’s because the Hebrew word translated very often as ‘soul’ means something like ‘life breath’…. It’s a very physical thing and there is no concept among the biblical writers in a split between body and soul. So I got rid of the soul.” 9 9 “After 24 Years, Scholar Completes 3,000-Page Translation Of The Hebrew Bible,” NPR: Morning Edition, January 14, 2019. (https://www.npr.org/2019/01/14/684120470/after-24-years-scholar-completes-3-000-page-translation-of-the-hebrew-bible). Yehoash claimed a similar goal of faithfulness to the same source text—above all, he wrote, the translation must be “true to the original,” avoiding modification, paraphrase, or interpretation as it is “poured from one language vessel into another.” But his Yiddish rendering of Hebrew scripture pursues this end differently, through an approach that is both retrospective and prospective. In the brief preface to his translation (apparently a short version of a lengthier introduction the author envisioned but did not live to compose), Yehoash asserted that his translation was made “in strict loyalty” to the Masoretic text. 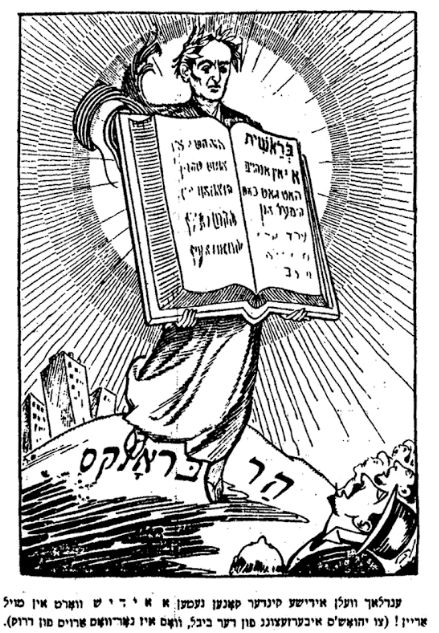 At the same time, though, he insisted that a proper rendering of the Bible into Yiddish must take in “all the antique nectars of old sacred texts”: the “idiomatic riches of old translations, works of moral instruction [muser], homilies [mayses], sayings, proverbs, folk witticisms, etc.” Together with modern concerns for “precision and concision,” the text should also have “all the directness, familiarity, and traditional qualities of the language of Tsene-rene”—the seventeenth-century Yiddish rendering of the liturgical Bible interwoven with translations of commentaries, a frequently republished work that epitomizes premodern vernacular Ashkenazi piety—as well as the “lovely, succulent words that teachers used in kheyder and which are disappearing together with the kheyder.” In addition, Yehoash argued, the translation must integrate all dialects of Yiddish. 10 10 “Yehoashes hakdome,” Toyre, neviem, veksuvim im yidish targum fun Yehoash (New York: Yehoash farlag gezelshaft, 1941), i. 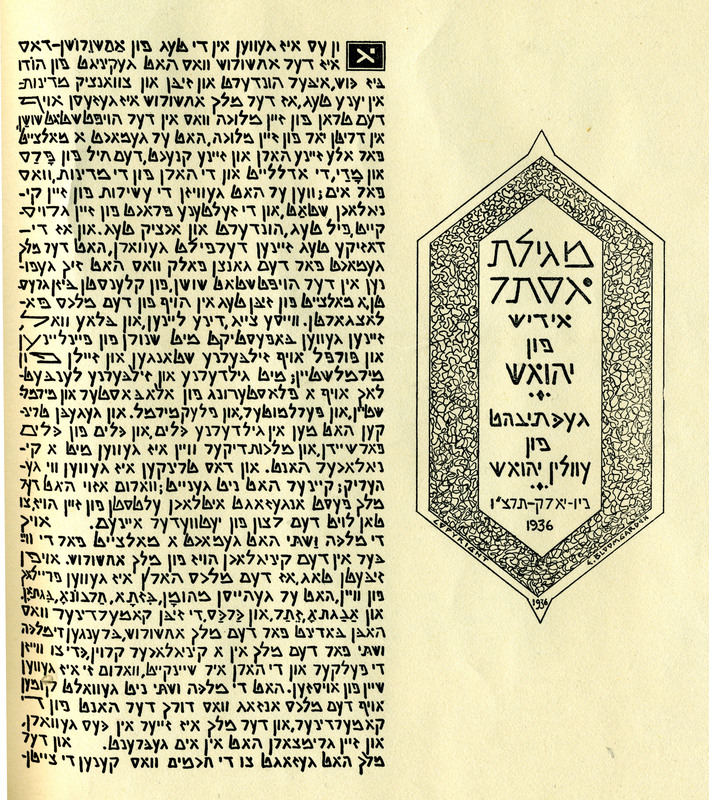 A page from the 1927 edition of Yehoash’s translation of the Tanakh. This is a bilingual edition, with the Hebrew in the upper left-hand corner of the page and the Yiddish taking up the remainder of the page. What unites these seeming disparities in Yehoash’s agenda—the modern and literary versus the traditional and devotional, faithfulness to the Masoretes versus embrace of the expansive elaboration of the Biblical text as mediated through centuries of Ashkenazi instruction and elucidation—is the author’s vision of what this translation would do for Yiddish speakers, their literature, and their culture. Yehoash characterizes the task as fulfilling “a double love”: for the Bible, “the most beautiful, most human book of the Jewish people and of all peoples,” and for “our Yiddish language.” 11 11 “Yehoashes hakdome,” i. (This bond is articulated more forthrightly in Yiddish than in English, conjoining yidishe folk and yidishe loshn.) Precedent translations—and translation practices, such as traditional study in kheyder, where children were taught to recite the Biblical text by rendering it, word by word, into Yiddish—are transformed from devotional phenomena into source material for a modern literary voice. Yehoash strove not only to draw on past Yiddish literature but also to forge a language of high culture for the future. Thus, one analyst of Yehoash’s translation notes that in his rendering of the Pentateuch the author had to create “a mass of new words for many expressions.” 12 12 Yehuda Rozental, Yehoashes tanakh-iberzetsung: an analitishe oysforshung (New York: YIVO, 1951), 126. This 1926 cartoon from the humor periodical Der groyser kundes (The Big Prankster), titled “The Jewish Torah in Yiddish,” depicts Yehoash as Moses (and as a laurel-wreathed Dante), descending “Mount Bronx” to present his Bible translation to awestruck onlookers. Yehoash’s vision of how modern Yiddish culture could engage with Hebrew scripture and its traditional reception extended beyond his Bible translation. Throughout his career he composed poems about characters and incidents from scripture, as early as “Japheth’s Daughter” (1892) and including works about Job, Esau, King Solomon, Delilah, the parting of the Red Sea, the shattering of the Ten Commandments, among others. With these efforts, as well as a Yiddish translation of Pirkei avot and Yiddish adaptations of Talmudic legends, Yehoash strove to situate Jewish tradition as modern Yiddish culture’s patrimony. This aspiration is epitomized by the title often used to refer to his Bible translation (and which appears on the spine of the two-volume bilingual edition of 1941): Targum Yehoash. This name situates the text in relation to the Targum, the ancient rendering of Hebrew scripture into Aramaic, used in the period following the Babylonian exile. At the same time, Targum Yehoash forthrightly credits the work of the sole translator, endowed with the modernist valence of author. Yehoash’s magnum opus did earn him great accolades in Yiddish cultural circles, both before and after his death. Indeed, a 1926 cartoon in the humor periodical Der groyser kundes (The Big Prankster), titled “The Jewish Torah in Yiddish,” both acknowledges Yehoash’s accomplishment and spoofs his acclaim. The image depicts Yehoash as Moses (and as a laurel-wreathed Dante), descending “Mount Bronx” to present his Bible translation to awestruck onlookers. The somewhat snarky caption reads: “At last Jewish children will be able to savor a Jewish/Yiddish word!” 13 13 “Di yidishe toyre af yidish,” Der groyser kundes, September 30, 1926. 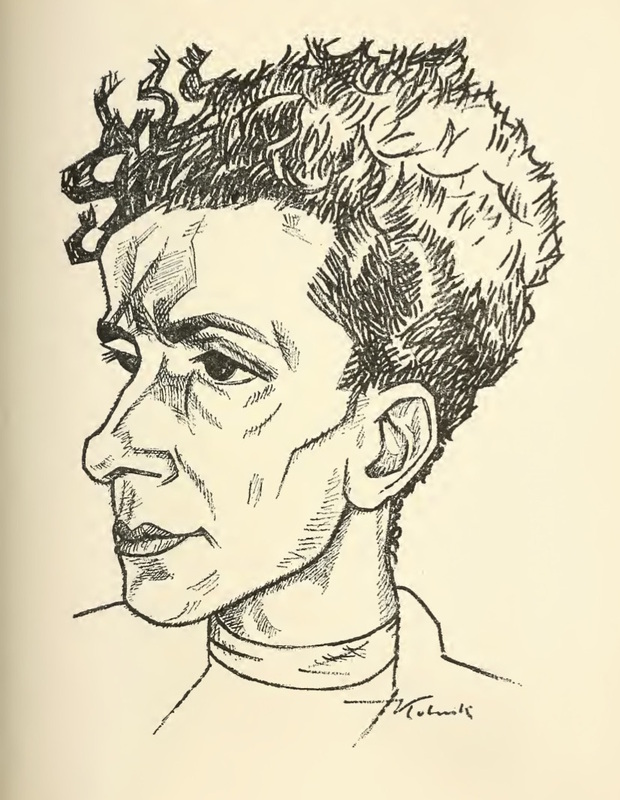 Alter has likewise garnered wide acclaim for his vision, erudition, and perseverance, in interviews and profiles, though within very different contexts and in recognition of divergent goals. In contrast to Yehoash’s project of Bible translation as a work of Jewish national enhancement, Alter’s translation addresses the vast, primarily Christian, Anglophone world as he attempts to demonstrate the disparity in sensibility between familiar English renderings of the Bible and ancient Hebrew language and literature (as well as the culture that engendered them). Whereas Yehoash’s translation strives for synthesis, Alter’s proffers an excavation. During the heyday of modernist Yiddish culture, Yehoash aspired to provide a translation that would advance literary creativity in the language by integrating its traditional past into a progressive present, his text serving as the Yiddish equivalent of the King James Version. Alter, working in an especially fertile period of probing scholarship on literary form and meaning, reaches back to the Bible’s source language, past several centuries of problematic renderings, including King James, to demonstrate their divergence from the style and sensibility of ancient Hebrew narrative. Each translator’s vision points up the challenges inherent in translation’s shift not only across languages but over time. One analyst questioned the poet’s aspiration that Targum Yehoash would have the linguistic and cultural impact of the King James Version, “a classic, authoritative text for all classes,” arguing that “Yiddish is far too advanced as a language and as a bearer of culture to be thus influenced today as compared with the English of four centuries ago.” 14 14 “Yehoashes hakdome,” i; Orlinsky, “Yehoash’s Yiddish Translation of the Bible,” 176. Alter’s desire to convey in English the rhythms, textures, and structures of meaning in Biblical Hebrew prompted him to produce a text that has a deliberately defamiliarized, sometimes archaic register—which is itself a modern idea of what “ancient” sounds like. And, as is true of many modern Bible translations, neither of these efforts stands on its own but is accompanied by notes on both the original Hebrew and questions of its translation. Like all translators, Yehoash and Alter are indebted to their source text—but also, in this case, to the trail of translations in multiple languages over millennia, both those with which they contend and those from which they draw inspiration. Through their translations as well as their discussions of the effort, both Yehoash and Alter grapple with the challenge of how we understand the Bible. We do not know it in the original ancient language (which was replaced centuries later by the Masoretic text), even when the Bible is read or chanted in Hebrew. Rather, our comprehension comes through our vernaculars and our strategies of striving to bridge the chasm between a long-lost language, as well as the people who produced and first used these texts, and our own linguistic and cultural sensibilities. At the same time that we move further away from the original Hebrew Bible and its earliest audience, we accumulate greater knowledge of what this text has meant to subsequent readerships, in large measure through these repeated efforts of translation. The work of Yehoash and Alter demonstrates how the act of translating the Bible can be meaningful in different ways, compelling individuals to take up the task and providing readers with rewarding opportunities to contemplate this text’s extraordinary trajectory. See Bertshi Vitkevits (Bernard Witt), Yehoash: A bibliografye fun zayne shriftn (Cleveland: Farlag A. Kahan, 1944), 3, no. 14. Robert Alter, The Hebrew Bible: A Translation with Commentary (New York: W.W. Norton, 2018); Khumesh, neviem, ksuvim: yidish fun Yehoash, 8 vols. (New York: Farlag “Tanakh,” 1926-1936). Robert Alter, Genesis: Translation and Commentary (New York: W.W. Norton, 1996); Yishaye, trans. Yehoash (New York: Farlag “Yehoash,” 1910); Iyev, Shir hashirem, Rus, Koheyles, trans. Yehoash (New York: Farlag “Yehoash,” 1910). Henry Wadsworth Longfellow, Dos lid fun Hayavatha, trans. Yehoash (New York: Farlag “Yehoash,” 1910); Yehoash’s translation of the Rubiyyat first appeared in Tsukunft, May 1907, 264-267. See Vitkevits (Witt), Yehoash: A bibliografye, 174-206. Yehoash Khumesh far kinder (New York: Yehoash farlag gezelshaft, 1940); Yehoash, Heores tsum tanakh (New York: Yehoash Farlag, 1949). On the publication history of Yehoash’s Bible translation, see Yaelle R. Frohlich, “The Publication and Dissemination of the Yehoash Bible, 1922–1942,” Shofar 35, no. 4, (summer 2017): 43-61. Harry M. Orlinsky, “Yehoash’s Yiddish Translation of the Bible,” Journal of Biblical Literature 60, no. 2 (June 1941): 174. Alter, The Hebrew Bible, vol. 1, xiii. “After 24 Years, Scholar Completes 3,000-Page Translation Of The Hebrew Bible,” NPR: Morning Edition, January 14, 2019. (https://www.npr.org/2019/01/14/684120470/after-24-years-scholar-completes-3-000-page-translation-of-the-hebrew-bible). 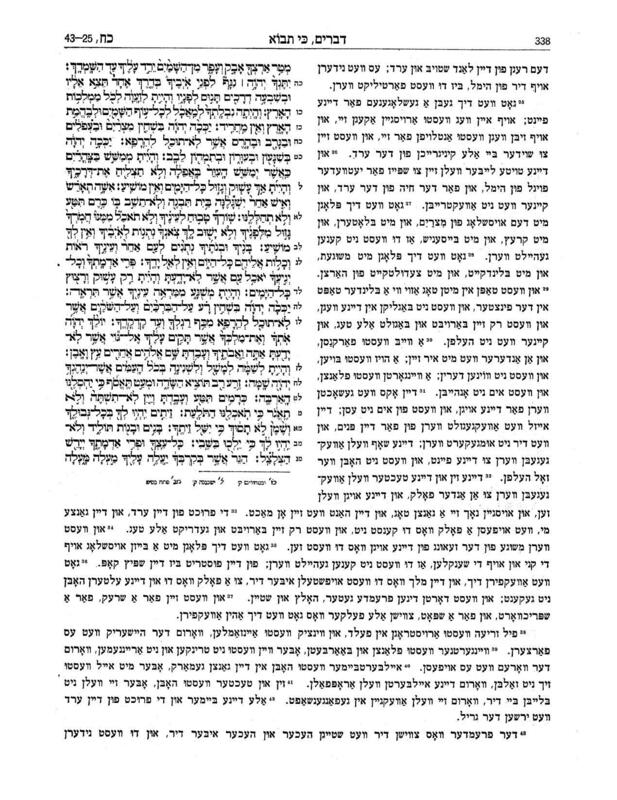 “Yehoashes hakdome,” Toyre, neviem, veksuvim im yidish targum fun Yehoash (New York: Yehoash farlag gezelshaft, 1941), i.
Yehuda Rozental, Yehoashes tanakh-iberzetsung: an analitishe oysforshung (New York: YIVO, 1951), 126. 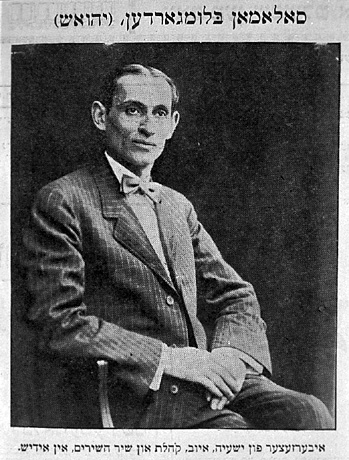 “Di yidishe toyre af yidish,” Der groyser kundes, September 30, 1926. “Yehoashes hakdome,” i; Orlinsky, “Yehoash’s Yiddish Translation of the Bible,” 176. Shandler, Jeffrey . “A Tale of Two Translators: Yehoash and Alter Take on the Tanakh.” In geveb, April 2019: https://ingeveb.org/blog/yehoash-and-alter-tanakh. Shandler, Jeffrey . “A Tale of Two Translators: Yehoash and Alter Take on the Tanakh.” In geveb (April 2019): Accessed Apr 20, 2019. 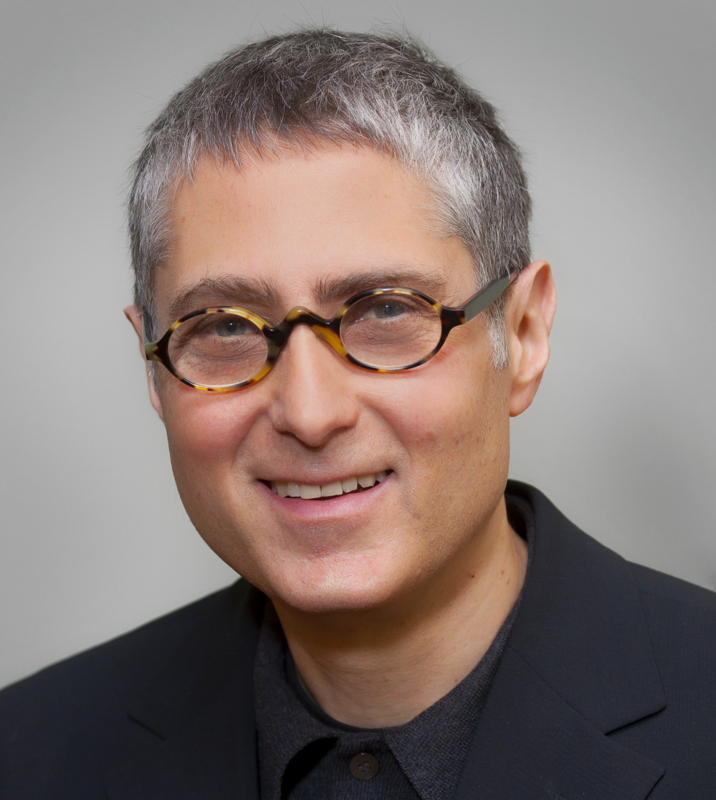 Jeffrey Shandler is Professor of Jewish Studies at Rutgers University.